Re: Carb to Injection tips??? webers are just about teh best thing you can get for these cars man. richard judge of teh UK boasts around 2oo hp with his and runs it at the tracks, drag and circuit. or he used too. Doin motorcycle carburetors is also a great idea and has done a few times before. Last edited by Prelude85; 01-22-2009 at 01:51 PM. well nothing against carbs but i dont have a bunch of money and it needed a motor so i am making use of what i got:) and besides you don't need crazy horsepower you just need to know how to put it down!!! 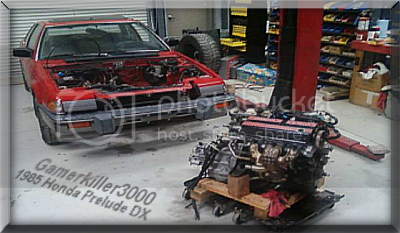 lol i could pull top ten times in a totalled accord with that motor so having a straight body car and time to tune it and get it dialed in i should dominate!! !